Hi, everybody! It’s Andy Gesner and the staff from HIP Video Promo ringing in the new year with an incredible new video! 2005 is here and we are beside ourselves with excitement to be bringing you the latest clip from The Postal Service. If there’s a group in the indie universe that needs no introduction, here’s one – but we’ll do it anyway. 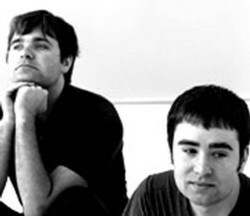 The act is a long-distance collaboration between Ben Gibbard of Death Cab For Cutie and Jimmy Tamborello of Dntel, and takes its name from the duo’s method of exchanging tracks. It’s an inspired union, and one that brings out the best in both principals: The Postal Service marries Death Cab’s poetry and passion to Dntel’s warm synthetic backdrops. The result? One of the most aesthetically successful synthpop projects since the Eighties, and a more approachable and user-friendly version of the experimental machine pop of Tarwater and Notwist. Gibbard and Tamborello began their collaboration in 2001, when the Death Cab frontman lent his voice to Dntel’s “This Is The Dream Of Evan And Chan”. The track worked so well – it’s one of the standout cuts on the haunting Life Is Full Of Possibilities – that the two artists applied their talents to a full-length. Enlisting Rilo Kiley’s Jenny Lewis to sing support vocals, the pair recorded the luminous Give Up in 2003. The album appeared on countless year-end top ten lists, earned raves in publications from coast to coast, and spawned several indelible underground singles – including “We Will Become Silhouettes”. Here is a song of mortality and danger, sung from the perspective of someone in a post-apocalyptic nuclear winter world. Yet given life by Gibbard’s plaintive performance, this story of impending apocalypse feels as sweet as a lullabye. Tamborello’s synthesizers spin and skitter like tops across a vintage Eighties beat.This is a pop song; and a brilliant, catchy one, too. Lewis’s backing vocals are as angelic and ethereal as a fading memory – they reverberate like echoes off of the roof of a bomb shelter. The three musicians are imagined as a space-age nuclear family. Jared Hess – the director of the hit underground filmNapoleon Dynamite – has made the clip for “We Will Become Silhouettes” a snapshot from the forgotten future. This is the first time the Postal Service members have appeared together in a music video. They’re shot together in the living room of a suburban cabin, sitting on sofas, and playing vintage instruments with blissed-out smiles. Gibbard croons into a tiny microphone as Lewis, playing a garage-sale synth, smiles back at him; Tamborello sits in an orange-upholstered chair, toying with a vintage drum machine. Next to them are two children, tapping their feet to the beat and singing along to the disturbing music. They look up at their “father” with respect and admiration. Sunlight streams into the living room through translucent curtains; the kids raid the pantry and make picnic baskets for the family. Later, dressed in robes reminiscent of Logan’s Run costuming, the family rides bicycles along a desert highway. (In one particularly humanizing shot, Tamborello runs over a tumbleweed, and nearly falls out of his seat). As the afternoon sun sinks in the sky, the smiles grow wider. Upon reaching a small mountain, the group lays down their bicycles and runs enthusiastically to the cliffs. Here, as elsewhere, Hess’s cinematography is dazzling – the song itself sometimes feels like it has the hallucinatory qualities of an overexposed photograph, and the director reinforces this sense by flooding his film with warm daylight. The family climbs the mountain, and tucks voraciously into undefinable food preserved in mason jars, and they watch the sun set over the desert. It silhouettes the musicians as they stand and stare, then fade into the scenery. We are extremely excited and honored to be working with the indie luminaries at Sub Pop Records. Long time friends Megan Jasper and Lacey Swain have been gracious enough to supply us with enough Vinyl copies of Give Up to support on-air giveaways, and copies of the single “We Will Become Silhouettes”(to be released February 9). If you need more info call Andy Gesner at 732-613-1779 or email info@HIPVideoPromo.com . If you haven’t already completely filled your head with information on this groundbreaking artist you can visit www.SubPop.com for even more on The Postal Service.